1722 – Thomas Burgh, MP for Naas, and Richard Stewart, MP for Strabane, receive the first £2,000 of £8,000 from the Irish parliament for operating their colliery at Ballycastle, Co. Antrim. 1818 – Bernardo O’Higgins formally approved the Chilean Declaration of Independence near Concepción, Chile. 1820 – The ships East Indian and Fanny, with about 350 Irish emigrants aboard, leave Cork for Cape Colony, carrying some of the “1820 settlers”. 1831 – Birth of John Morrissey (in Co. Tipperary), also known as Old Smoke, was a bare-knuckle boxer and a gang member in New York in the 1850s and later became a Democratic State Senator and U.S. Congressman from New York, backed by Tammany Hall. 1847 – Eyewitness Report on Horror of starving victims of ‘An Gorta Mor’. 1860 – Death of Sir Willliam Francis Patrick Napier born at Celbridge, near Dublin. 1922 – In Belfast, violence erupted in response to the Clones shootings. Between 37 and 39 people were killed. This included six children who were killed when loyalists threw a grenade into their school yard. Forty other children were injured in this attack between 12-15 February. 1923 – Birth in Castledawson, Co. Derry of James Chichester-Clark, Northern Ireland Prime Minister from 1969 to 1971. 1930 – Birth of John Doyle (in Tipperary), an Irish sportsperson and politician, hailed as one of the best defenders in hurling and his county’s most iconic player upon his death. 1949 – Fergus Slattery, rugby player, is born in Dún Laoghaire, Co. Dublin. 1971 – Delia Murphy, ballad singer, dies. 1976 – Frank Stagg, Irish political prisoner, dies on hunger strike in English prison. 1989 – Patrick Finucane is murdered by Unionist assassins; Finucane, who acted as solicitor for republican hunger striker Bobby Sands was shot dead at his north Belfast home in front of his wife and children. 1996 – Death of Bob Shaw, a science fiction author and fan from Belfast. He was noted for his originality and wit. He was two-time recipient (in 1979 and 1980) of the Hugo Award for Best Fan Writer. His short story “Light of Other Days” was a Hugo Award nominee in 1967, as was his novel The Ragged Astronauts in 1987. 1997 – The PIRA’s “South Armagh snipers” shot dead a British soldier manning a checkpoint in Bessbrook, County Armagh. He was the last British soldier to be killed during Operation Banner. 1998 – The IRA insists that their ceasefire is still in place — despite “speculation surrounding recent killings in Belfast”. 2003 – Irish musicians are hoping their plea to stop US military aircraft refuelling at Shannon will strike the right chord with the Government. More than 50 top acts have signed an open letter which will be sent to the Taoiseach asking him to end the refuelling stopover at the airport. 2003 – Mystery surrounds the identity of an artist as 24 of his paintings are launched at the Irish Museum of Modern Art (IMMA). Known only as “John the Painter”, he has been in psychiatric care in Cork city for more than 30 years. 2009 – Death of Irish playwright Hugh Leonard. 2012 – Death of the very popular Irish actor David Kelly, who played everything from Beckett to Shakespeare but is best known for his roles in light comedy works. 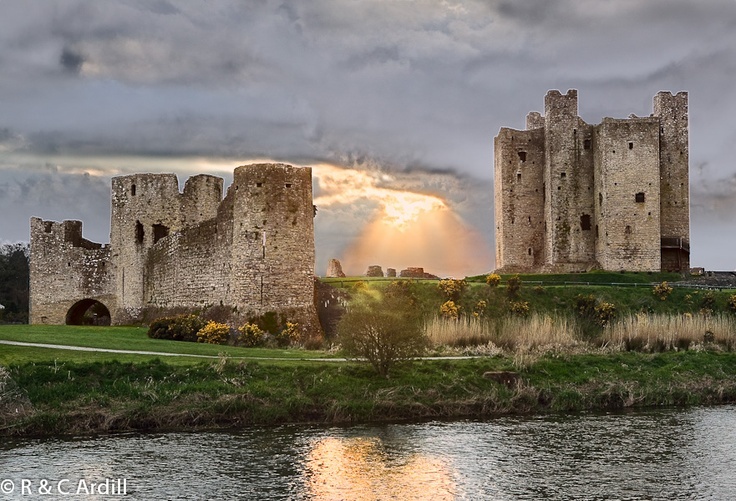 Photo: Trim Castle built by Hugh de Lacy is the largest Anglo-Norman castle in Ireland. Construction began in 1176 on the site of an earlier wooden fortress. Trim Castle was the location for King John’s Castle in the film ‘Braveheart’ the 1995 historical drama directed by and starring Mel Gibson. Photography by R&C Ardill. 1921 – Three IRA prisoners Ernie O’Malley, Frank Teeling and Simon Donnelly escape from Kilmainham Gaol in Dublin.